On this week’s update: scientists predict the return of El Niño, a sound fence protects animals, and InSight touches down on Mars. 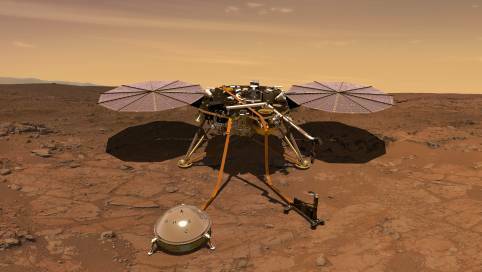 And the InSight lander touches down on Mars. First up, a group of meteorologists, or weather scientists, has predicted the world might soon experience some pretty unusual weather, caused by a phenomenon known as El Niño. During El Niño, winds that push warm surface water into the western Pacific Ocean become weaker. This changes which parts of the ocean are warmest. And that has a big impact on weather—all over the world. For example, areas that normally get lots of rain can run out of fresh water—a situation known as drought. Meanwhile, lots of rain can fall in places that are normally very dry—causing flooding. El Niño events occur every few years. By predicting that another one is likely, scientists can help communities to prepare for the unusual weather. Next up, the island of Tasmania, in Australia, is home to some very unusual animals, including the famous Tasmanian devil. When these animals try to cross roads, they’re in danger of being hit by cars. Now, a sound fence is helping to solve the problem in one part of Tasmania. The “fence” is actually a series of alarms along the side of the road. As a car approaches, its headlights activate the alarms, which use loud noises and flashing lights to warn animals to get out of the way. The sound fence has nearly halved the number of animals killed on one stretch of road. Now, there are plans to use the technology across Tasmania. And finally, it’s Space Track. This was a nail-biting moment for the team at NASA’s Jet Propulsion Laboratory. 20 metres… 17 metres… Standing by for touchdown. They were waiting nervously to see whether the InSight lander would successfully reach the surface of Mars. Now that InSight has landed, it will soon start gathering data about the inside of Mars. This will help scientists understand how other rocky planets were formed, including our own planet, Earth! That’s all for this week. We’ll see you next time! Meteorologists have predicted that an El Niño event is likely to happen in the near future. El Niño causes unusual weather across the world, such as droughts in areas that normally have high rainfall. A “sound fence” in Tasmania is helping to protect animals trying to cross roads. The fence uses sounds and flashing lights to warn animals when a car is approaching. NASA’s InSight lander has touched down on the surface of Mars. It will gather data about the inside of the rocky planet. This graphic organiser supports your students to capture their thoughts and questions as they watch the news update. When the winds blowing west across the Pacific Ocean become weaker, it changes which parts of the ocean are warmest. Why do you think this happens? What impact might a drought have on local communities—for example, their access to food and water? How could people prepare for possible flooding caused by unusually heavy rain? Why do you think animals might try to cross a road? The “sound fence” is actually a series of alarms with gaps between them. Why might this be better for wildlife than a real fence with no gaps? Can you think of any other ways to protect animals from being hit by cars? The team behind InSight decided to land it on a flat, sandy part of Mars where there aren’t many rocks. Why do you think they chose this location? Why do you think InSight’s designers gave it a parachute to release as it fell towards Mars? If you could send a spacecraft to Mars, what would you want to find out? Complete your lesson with teaching resources from Tigtag. Discover free online CPD for primary science from ReachOut CPD.